Great with cocktails and a few other things. When my parents were still living I always knew when we visited in the fall I would be taking home pecans; 200# was the most I ever took home. I would have them cracked while there and knew it would take me a couple of months of shelling them before I was done for the year and we would have a freezer full to last me through all the catering events. One year, I waited a little too long to finish shelling and the pecans were in plastic bags and not a breathable mess bag so I had to dump them outside. There were so many pecans that it took the squirrels about 2 months to take them away. Guess by the time they were finished they claimed me as a friend for life. Now, why do I still like those pesky little critters. I will always remember when we were visiting at the right time of the year, with a yard full of pecans (they had about 6 trees), we would walk around the yard with my mother or dad picking up pecans. Now, to me, that is the most relaxing times I can remember. Picking up pecans are like searching for those hidden Easter eggs we looked for as kids. Walk, talk, stoop, pick up, talk, walk and it was a great way of finding out things going on in their lives. 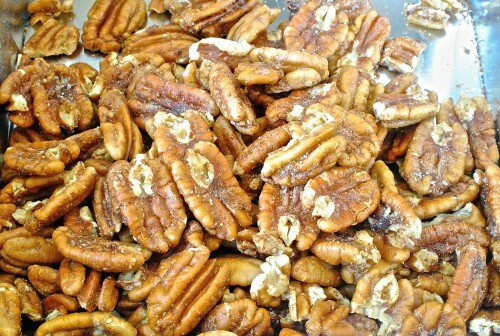 Way before, I’m sure, someone invented a pecan picker-upper. My dad took a pole and attached a “slinky” to it and he would push it down on the pecan and the slinky would pick it up and when the slinky was full enough it would get dumped in a bucket. I really miss those moments and I cannot look at a pecan in a shell and not think of their place in Tennessee. We always thought our dad was a renaissance man and one day I’m posting all the remarkable things I remember about him. I no longer get those pecans so when I do have some given to me by my sister, I hoard them and use sparingly. There are a lot of savory nut recipes out there and one of my favorites is The Best Bar Nuts in NYC that was printed in a Union Square Cookbook. 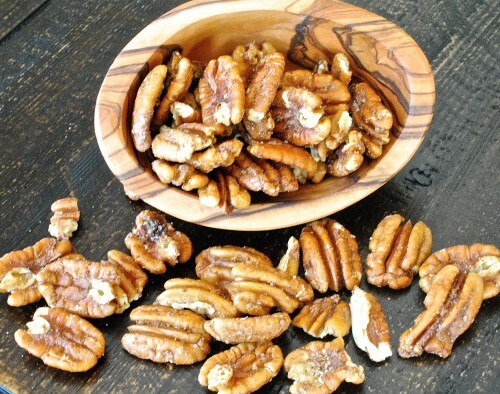 I love those but the recipe below I use only pecans when making it and they are so easy to make. These can be eaten as is or chop and put in a salad. The original recipe I started with did not have the sugar; I decided to add it to add a little sweetness to use in my salad. Here are some things I have done recently with these nuts; I’ve put them in my Christmas salad, I’ve eaten them for a snack and for my Downton Abbey Tea I chopped them up and put them in some olive spread for a little tea sandwich. BLAST FROM THE PAST: Zucchini Tomato Boats is a recipe I posted back in 2013. If you are looking for some vegetable recipes to start the year with, give this a try; it was a really good side dish. Preheat oven to 300°F. Place the pecans in a large mixing bowl. In another bowl, whisk together the melted butter, Worcestershire sauce, salt, garlic powder, ground mustard, Tabasco, and cayenne. Pour the butter mixture over the pecans and stir until well combined. Taste a pecan and add more Tabasco or cayenne if desired. 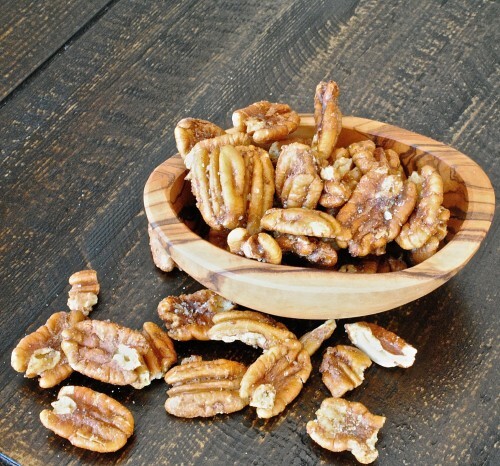 Arrange the pecans on a large sheet pan and bake for 20-22 minutes until toasted and lightly browned, stirring halfway cooking time to prevent burning. Remove from the oven and cool completely, tossing occasionally, before transferring to an airtight container.